Let’s get started! First we have the Phickle-Phyfe Fluted Dresser for $350. Lady Rosalynd of floor mirror fame has kindly agreed to help us with the demonstration today. 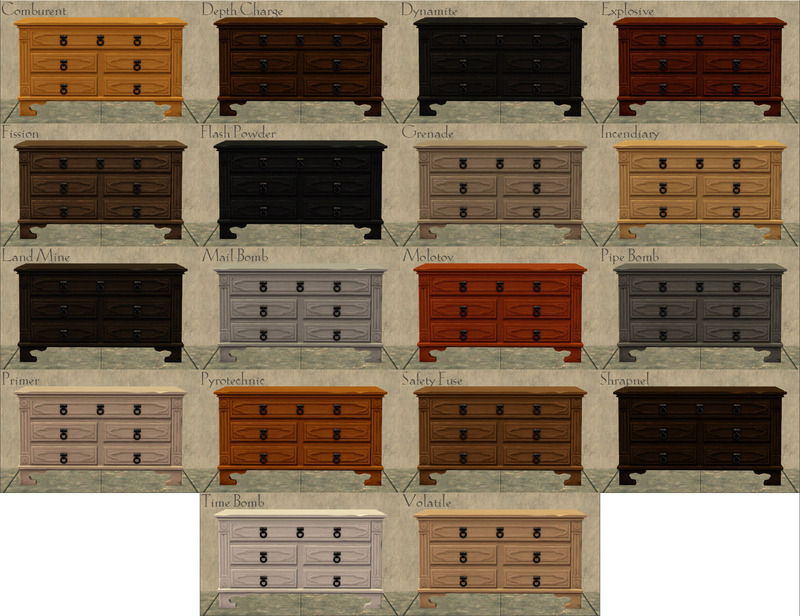 Next is the Pre-Invasion Belted Battle Dresser for $365 (the tattered cloth looks more post-invasion to me, though). Mesh is in Primer; otherwise it has the same recols as above. Of course, the cloth gets recols as well. Not in Pooklet’s eighteen naturals, though. 😛 It has to make do with four recols, using patterns from the Isle of Catarina Sims. After that, we have the Burdley Revival Dresser for $380. Mesh is in Comburent. Which is followed by the Pyrotechnic Vestimentum Dresser for $450. Note that the recol files are a bit larger for this one, around 350 kB each. This is because of the bump map; I really wanted all the little gold details to look nice and bumpy, but they got completely lost when I scaled the bump map down. So full-size bump map it was. Then comes the Ars Magique Curvenform Dresser for $575, in Incendiary. This one is my favourite. Isn’t it cute? 😀 I think it’s cute! And last but certainly not least: the Rot-proof Stone Dresser for $720. 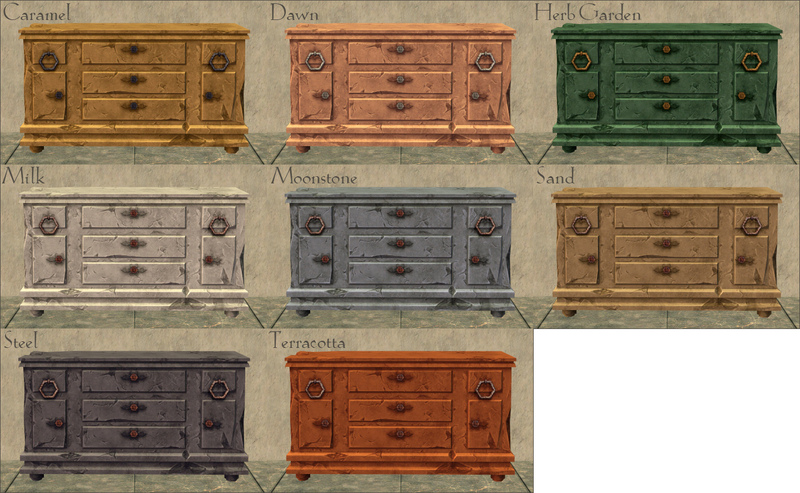 In addition to the original TSM recol above, the dresser comes in eight ACYL colours and the handles in three (seen in the first three pictures). EAxis cheated with this one, though, and put the red details behind the handles on the texture, not the mesh (but they can get away with it in TSM since this particular dresser isn’t designable). This is why they recolour with the dresser and not with the handles. This entry was posted on 24 March, 2014 at 17:48	and is filed under Animated, BUY MODE, CONVERSIONS, DOWNLOADS, Dressers, Medieval-ish, Objects, THEMES, TSM. You can follow any responses to this entry through the RSS 2.0 feed. You can leave a response, or trackback from your own site.